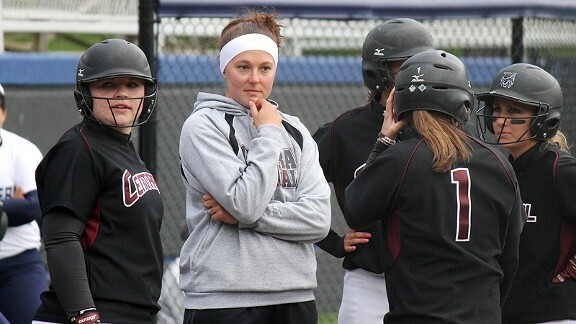 Mallory Holtman recently completed her second season as softball coach at her alma mater, Central Washington. ELLENSBURG, Wash. -- Standing at the railing in a dugout normally reserved for the home team in the old Yankee Stadium, real estate once occupied by the likes of Babe Ruth and Mickey Mantle, Mallory Holtman watched ball after ball sail over the iconic checkerboard outfield grass and settle back down to earth in the seats beyond during the 2008 Home Run Derby. As Texas Rangers star Josh Hamilton put on a show at the plate, the night sky in the Bronx was illuminated by camera flashes as much as by the stadium lights high above her. It was a sensation at once familiar and foreign. The nice hotel, the gift bag and the gate attendants at the stadium who passed around her ticket before politely suggesting she and the other two girls might want to try the VIP entrance the next time -- all of that was new, if not exactly unpleasant. But much of her life to that point had been spent in dugouts, more hours than might be wise to count and certainly more hours than she spent sitting in stands, so those surroundings, at least, felt normal. Or they did until someone like Derek Jeter walked by as casually as if he was in, well, his dugout. It was like a person who had been raised on ponds stumbling across the Pacific Ocean. Surrounded by all of it, by the sights and sounds of a building brought to life by 50,000 fans and with All-Stars relaxing on the grass in front of her, it took a few minutes to even notice the man in the cap to her right. She almost didn't realize she was standing next to Reggie Jackson. It wasn't the only instance in the months that followed her role in a memorable act of sportsmanship in which Holtman might have felt she was living someone else's life, but it was among the most memorable. Both were there because of home runs. For Jackson, it was the regularity with which he hit them during a Hall of Fame career, many in front of crowds just like the one in the Bronx that night. For Holtman, although she hit more balls out of the park for Division II Central Washington University than any softball player who came before her, it was a home run for which she was initially a bystander. That one moment is what most people know of Holtman, one moment in which she saw an opponent crumpled on the ground and acted on what she felt was fair. When a freak knee injury left the University of Western Oregon's Sara Tucholsky unable to round the bases under her own power after hitting the first and only home run of her career, Holtman and Central Washington teammate Liz Wallace carried their opponent the rest of the way. They did it so that history, however small a place the event might occupy in its chapters, would record the hit for what it was. Witnessed by perhaps a hundred people live on April 26, 2008, the image of sportsmanship personified went viral in a matter of days. It earned all three players national acclaim, complete with awards, speaking engagements, television appearances and even an invitation from Major League Baseball commissioner Bud Selig to attend the Home Run Derby and All-Star Game in New York. For a time, Holtman's life was the kind of place where she found herself shoulder to shoulder with Mr. October in a dugout -- in his dugout. It was all larger than life. "Looking back, I can't believe what I've done, but at the time, it all happened so quickly that it was just a shock," Holtman recalled. "It was fun. I got to experience things, especially in that first year, that most people will never experience in a lifetime." Four years after one moment sparked a whirlwind ride that at one point dropped her next to one of the greatest sluggers in baseball history, Holtman is back in Ellensburg, a town of roughly 18,000 people set amid the foothills of the Cascade Mountains that separate it from Seattle about 100 miles to the west. She recently completed her second season as her alma mater's coach, one of the youngest head coaches in the country at age 27. She is a proud first-time mom, her son Braxton born this past December, and she is getting married this summer. She is back in a more familiar dugout on the third-base side of Gary and Bobbi Frederick Field, named for the man who entrusted her with his program and his late wife. A nondescript diamond tucked away next to student housing on the far edge of campus, it is not Yankee Stadium by any stretch of the imagination. It would take a lifetime to draw 50,000 fans, and on a blustery April afternoon, the few rows of seats in the lone metal bleacher behind home plate are no more than half full with fans bundled up in hats and coats for Central Washington's home finale, many of them waiting for a home run derby for ROTC students between games of a doubleheader. The interstate skirts the edge of town, but the beaten path doesn't come within miles. And there is no place she would rather be. There is an ESPY on a shelf in Holtman's house, the hefty statuette poking above family photos. There is a framed photo on another shelf of her standing with Justin Timberlake. And somewhere she is pretty sure there is a photo of her wearing a Super Bowl ring conveniently borrowed for the occasion from former Giants tight end Kevin Boss. She has stories to last a lifetime because she was the right person in the right place at the right time. She is living the opportunity of a lifetime because Coach Frederick believed so strongly she was the right person for more than that moment. It's why one memorable home run is where the story only begins. Not long after news of the home run in the game between Central Washington and Western Oregon began to spread, Frederick received an email from a self-described "redneck logger" from Grants Pass, Ore., who admitted he cried his eyes out as he watched the scene unfold. He wasn't alone. Messages poured in from fans of softball and people who had never watched a game, from coaches to clergy, even military personnel deployed in war zones. They all read the accounts or watched the amateur video from that afternoon, Holtman and Wallace supporting the diminutive Tucholsky between them and gently lowering her at each stop so that she could touch second, third and finally home. So many couldn't help but feel witness to something good and decent at the most fundamental level. "I was in awe of them because to be able to have that kind of integrity, it inspired me," recalled former UCLA softball coach Sue Enquist, the all-time leader in winning percentage among Division I coaches. "It made me say, 'Yeah, Sue, step up your own game.' Any time something like that happens, it stops you." But the reaction in real time was less visceral. Holtman shed plenty of tears that day, but most of them came when she and other Central Washington seniors were honored between games of the doubleheader, the team captain and the school's all-time home run leader at that time keeping her sunglasses on during the ceremony in an attempt to hide the emotion. The suddenness and unqualified strangeness of what followed in the second game, Tucholsky hitting her first home run in four years only to tear her ACL when she attempted to double back to first base after missing the bag, created mostly confusion. As Tucholsky lay on the ground by first base in obvious pain, umpires mistakenly told Western Oregon coach Pam Knox that the runner would be out if touched by someone on her own side, the home run thereby erased and recorded for posterity as nothing more than a single. Knox said at the time that as much as she knew Tucholsky was in pain, she also knew the senior would never forgive her if she lost the home run. At one point during the protracted discussion that ensued, Bobbi Frederick, the coach's wife who was by then confined by ALS to a wheelchair -- in body if not in spirit -- called out that they should just use her chair. Nobody seemed quite sure what to do until Holtman asked the umpires if it would be within the rules if she and Wallace carried their injured opponent. "What I remember most was just Sara and just needing to do something for her," said Wallace, who now works in human resources and coaches youth softball in her spare time in Southern California, where her husband is stationed in the Navy. "And I didn't know what it was, but I knew that we couldn't all stand around there and talk anymore about it while she's laying there in so much pain. I do remember Mallory going up and saying something; I think it just popped in her head and she spit it out." 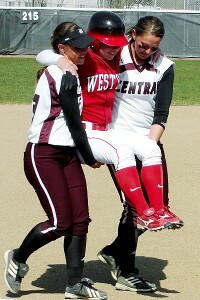 Central Washington's Liz Wallace, left, and Mallory Holtman carried Western Oregon's Sara Tucholsky around the bases in an act of sportsmanship that drew national reaction. As they made their way slowly around the bases, the three players lapsed into sporadic laughter, struck by how strange the whole scene must have looked, but they had no sense they were part of something the whole country would notice. After Holtman and Wallace turned Tucholsky over to her teammates at home plate, the game resumed as if nothing had happened. In the moment, more important matters loomed. Central Washington entered the doubleheader just a game behind Western Oregon in the conference standings, but an 8-1 loss in the first game made the finale a must-win for the home team. In large part thanks to Tucholsky's three-run home run, Western Oregon instead completed the sweep with a 4-2 win (and went on to share the conference title and reach a regional final in the Division II NCAA tournament). The disappointment of those losses, mixed with leftover emotion from the final home games for the seniors, pervaded when players and coaches from Central Washington gathered in the outfield for a postgame meeting in a sport where there are rarely locker rooms to which teams can retreat. It wasn't until an elderly fan, walking with a cane, made his way toward the circle that the tone shifted. His presence in their midst was an etiquette violation, an intrusion into a world marked off by foul lines, but the incongruous nature of his appearance only reinforced the sincerity of the message. "He had tears in his eyes," Wallace recalled of the stranger. "He just wanted to tell us 'thank you' and tell us that was such a good thing. I remember being a little shocked." Central Washington played a doubleheader in Seattle the following day, and it wasn't until the team returned from that trip that interview requests started to come in and the outside world started to take notice, but that moment with an interloper in the outfield was the first indication for many on the field that the losses wouldn't be what most people remembered about that afternoon. "He thought it was that important to come out and tell us that," said Kelli Spaulding, then in her first season as a graduate assistant coach. "That's when we kind of took it in and said, 'I think something great just happened.' It was an amazing thing to have happen for Mallory, for our program, for the sport itself." One of Holtman's more cringe-worthy experiences during the rush of attention in the months that followed was a Japanese anime recreation of the story that took the liberty of making her character a bully redeemed only by a moment of enlightenment upon seeing her injured opponent on the ground. The truth as her coach knew it was something different. Frederick felt the same pride that Spaulding described settling over all involved once the dust cleared that day, but he wasn't surprised by the identity of the protagonist. Holtman was his best player (she still holds the program's career records for slugging percentage and on-base percentage among those who played four seasons), but she was also the one who understood more than most a philosophy that Frederick spent five decades practicing. Play the game as if it means everything; understand that it doesn't. "One of the things we always talked about was respect the game of softball, respect your parents and respect your opponents," Frederick said. "The very first meeting we had with players, one of the things we always went through was put in order what the priority in this program was. The first priority was family, the second priority was academics and third priority was softball." The game between Central Washington and Western Oregon and those unaffected images of Holtman and Wallace carrying Tucholsky around the bases embodied that spirit to such a degree that it captured the attention of people who knew nothing of the schools and cared little about the sport. It was simple and fair. It was what one person can do for another. The game was also the last one Bobbi Frederick saw her husband's team play at the field now named in the couple's honor. For two who loved her, Gary and Holtman, what seemed cruelly unfair and complicated offered an equally persuasive argument for what people can do for each other. 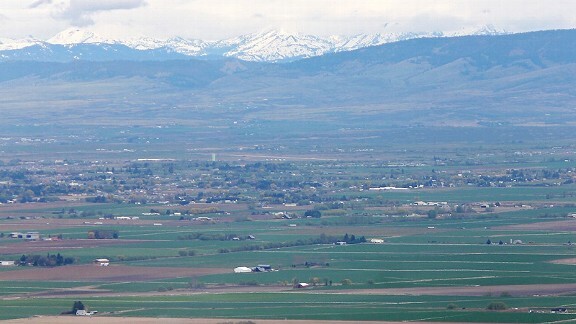 Gary was born on the other side of the Cascades, but he recalled a sense that he was home the first time he came to Ellensburg. That was in 1954, when he was still a high schooler visiting the town for Boys State, an American Legion event intended to develop young leaders. He played four years of football for Central Washington, the school then barely a tenth of the size it is now, with more than 10,000 students. After brief stints following graduation as a high school football and baseball coach in small towns across the state, he returned for good in 1967. There are few jobs he hasn't held for the athletic department in the intervening decades. Now one of Holtman's assistant coaches -- the closest he may come to retirement -- he was the head coach in baseball for 10 years, women's basketball for 11 years and softball for 15 years. In addition, he was the athletic director for 18 years and served intermittent stints as an assistant football coach and a physical education professor that often overlapped with his head coaching duties. Like with a lot of young coaches who succeed, there was a time when he felt the temptation of the unknown, the sense that something bigger and better awaited him elsewhere. Two of his baseball players in those early days went on to play in the big leagues: Dave Heaverlo and Bill North, who started in center field alongside Reggie Jackson for the Oakland Athletics on back-to-back World Series championship teams in 1973 and '74. Turning out talent like that from a small school was the kind of thing that might get a young coach noticed. But the job offers he imagined and even sought never came. "I thought I was pretty successful and applied for a couple of jobs and didn't get an interview or anything, so that's kind of humbling," Gary said. "You think you're pretty good. But that was OK; this is a pretty good place. I didn't really want to leave. It's familiar and secure. I think ambition's great, but sometimes there are more important things." Things like raising a family. While he was having a drink one day in a local bar, someone introduced him to Bobbi. Both had been married before and had children. They dated for a year and a half, married and spent the next 30 years together. They raised their children together and became community fixtures. When he took over as athletic director, not the seat of power in Division II that it is at some Division I schools with almost unlimited budgets, his family worked the concession stand at basketball games. He is the archetypal figure who exists in small towns, a person few outside the region know but a person everyone in Ellensburg knows. I don't think we were in denial that she would die, but it's one of those things where at a young age, when you haven't experienced the death of someone you love to the extent of watching her die, it's very hard. ... She never complained, never did anything, always had a positive outlook. You can delay it, but you can't cure it. And at some point, it will take your life. Just knowing that, it's hard to take in, just knowing you can't help them, no matter what you do. And for so much of his time in Ellensburg, he was at his best as half of a partnership. "Just listening to Gary talk about [Bobbi], you could just tell how in love he was with her," Holtman said. "She was a little spitfire. She was hilarious. She would come to all the games, she would make sure we had snacks for trips, or if we were gone for Easter or Valentine's Day, she would pack us something extra special." Gary was already well past 50 by the time, in his role as athletic director, he created the softball program in 1993 in an effort to adhere to Title IX and expand opportunities in women's sports. Two years later, eager to return to a bat-and-ball sport after years away from baseball, he gave the softball coach the women's basketball job she wanted and took over on the diamond. His background made it easier for him to pick up the nuances that differentiate softball from baseball, things like softball's emphasis on bunting and slapping or the mechanics of a different style of pitching. He was a good softball coach with an exhaustive memory of opponents and situations. He took winning seriously. "I want to make sure that I give Gary justice because he was a great softball coach when you're talking about skills and fundamentals and strategy," Wallace said, "but I think he brought a lot more to us than just softball. I think really his big thing was he's preparing us for the rest of our lives. It sounds kind of cliché, but that's what he was trying to do. The speeches he gave and the things he said to us as a team and individually, he was always concerned about that bigger picture. We were going to be our best softball players, but we were also going to be the best people we could be, and so he really brought that into all elements of his coaching. That's what I really appreciated." Bobbi was diagnosed with ALS in 2006, although in hindsight, Gary believes she showed symptoms well before then. There was no hiding the illness from the team; Bobbi was too much a part of things, particularly for players who had come to know her before she was diagnosed. Two of the closest to her, perhaps because she saw the same in them that her husband did, Holtman and Spaulding often went to visit her at the family's home. On one such visit, when she was well into her battle with the disease, they had to help move her. They could see the pain on her face with every shift, but she never made a sound in protest. When they were finished, she asked if she could get them anything. In the months after the home run, Bobbi found time to tell Holtman again and again how much she deserved all the accolades and attention, and how proud she was was of her. But by that December, she was gone. "I don't think we were in denial that she would die, but it's one of those things where at a young age, when you haven't experienced the death of someone you love to the extent of watching her die, it's very hard," Holtman said, her voice still choked with emotion years later. "There's no cure. ... It's one of those diseases where you have to accept your fate. She never complained, never did anything, always had a positive outlook. You can delay it, but you can't cure it. And at some point, it will take your life. "Just knowing that, it's hard to take in, just knowing you can't help them, no matter what you do." Nearly 50 people, along with Mallory Holtman, applied for the Central Washington opening. When she was a junior at Central Washington, long before anyone outside of Ellensburg or her hometown of White Salmon, Wash., had reason to know her name, Holtman told Gary she planned to be the first to apply for the coaching job whenever he decided to retire. People at that age say a lot of things about their plans for the future, but this one didn't come as a whim. Nor did Gary take it as one, coming from the daughter of a coach and a player with a particular passion for the sport. A car is the ideal 16th birthday present for most kids; Holtman received the batting cage she wanted from her parents. She spent countless hours in it, her dad throwing her pitch after pitch from behind a screen and her mom pulling up a lawn chair to supply commentary, teasing her daughter in describing well-struck balls sailing toward an imaginary fence, only to be pulled back at the last second by an imaginary leaping outfielder. By the time Holtman asked if she and Wallace could carry Tucholsky around the bases on that afternoon in Ellensburg, she herself was already awaiting surgeries on both knees at the end of the season. She pursued the game in a way that made Gary take her at her word when she said she wanted to succeed him. So at the end of a summer tour in 2008 -- which included an appearance on Ellen DeGeneres' talk show; a part in a skit opposite Timberlake as part of the ESPY Awards; throwing out the first pitch at the Women's College World Series; and that trip to New York for the All-Star Game and Home Run Derby -- Holtman returned to Central Washington as a graduate assistant coach and began work on a master's degree in athletic administration. 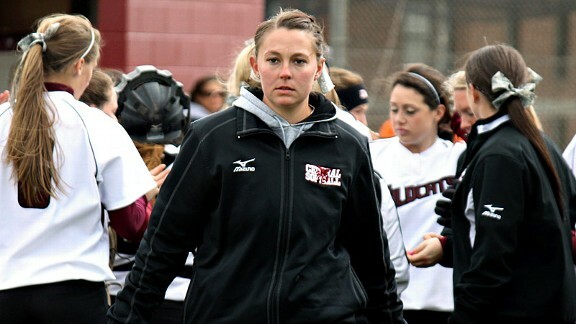 Softball rosters at colleges around the country include former players filling roles as graduate assistants or volunteer coaches in the first couple of years of their post-playing days. It's something to do while preparing for whatever it is that comes next. For Holtman, it was what came next. Gary gave her opportunities to dive into every aspect of the job, from the most tedious paperwork to setting lineups and scouting and recruiting Samantha Petrich, who came to Central Washington from a junior college and went on to become a Division II All-American. In a different age, she wouldn't have been called an assistant; she would have been called an apprentice. During her second year of graduate school, Gary told Holtman he was planning to step down. But he would only do so, he added, when she finished her master's degree, something she would need to be considered for the job at such a young age. The timing was not coincidental. Had she not been there, had she not wanted the job, he would have continued coaching. "I knew that she wanted to continue coaching, and I knew she wanted to stay here in Ellensburg," Gary said. "And basically I was selfish, in a way, because I wanted a hand in who was going to run the program when I stepped down." It wasn't quite that easy. Nearly 50 people applied for the opening, but the committee responsible for the hiring at least knew Holtman's experience went beyond what her résumé might suggest. Even Holtman didn't know with any certainty that she would get the job. Her fiancé, Ryan Fletcher, had only recently moved to Ellensburg, leaving behind a job to do so, but the two agreed that if she wasn't hired by Central Washington, they would move to California, where he could reclaim his old job and she would try to latch on as an assistant coach at another college with any opportunity to run a program likely delayed by years. One of her first moves when she learned she indeed would be the second coach in Central history was to make official what she had already discussed with Gary. He would stay on as one of her assistants. Alone on the field before practice one day this April, tending to the dirt and grass as he does every day (the program still doesn't have such luxuries as a tarp to protect the infield from the elements), Gary moves without any of the hesitation that might be expected of someone closing in on 75 years old. Among the things Holtman liked when she visited as a recruit was how active the coach was during practices, and he still has more than enough energy to hit a fungo or bark at an umpire about a call. But there was a time when that energy faded. He put on weight near the end of Bobbi's life, all of his time and energies going to her. And in those first years after his wife's death, Holtman recalled a man who retreated into himself and seemed at times half there. Time gradually lifted the fog. So, surely, did seeing Holtman rise to meet the challenge, first as an assistant and then as his successor. One part of his life taken away, he was confronted each day with evidence that another part of him, and part of Bobbi, really, would remain long after he was gone. Asked if he saw any similarities in Holtman and his late wife, he didn't struggle to find the word. Toughness. Last summer, the new coach found herself with a bit of money left in the budget after making field improvements. She had a sign added to the lip of Central Washington's dugout, the phrase "Never Give Up" stenciled on it in school colors. It was the phrase Bobbi used in her fight against a disease she knew she wouldn't beat. In its own way, it was also the message she left to those who loved her. "It took him a while to learn to live without Bobbi, but I think one of the best things she could have done in her passing was she made Gary promise he was going to go on," Holtman said. "Not just living and thinking about life without Bobbi, but live and really experience life. She let him know that 'If you find somebody new, it's OK. I want you to love, I want you to have fun and go do stuff.' She took the guilt off Gary because he shouldn't be guilty that he's still alive. "He's lucky that he's still here, and we're lucky he's still here. I wish we had both of them, but to have one of them at least is something to be thankful for." 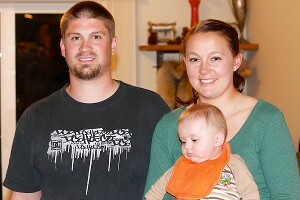 Mallory Holtman has settled down in Ellensburg with fiance Ryan Fletcher and son Braxton. In late October last year, Gary remarried. Little more than a month later, Holtman and Fletcher welcomed Braxton to their family. And so life moves on in Ellensburg. Holtman may be the only person at Central Washington who has an ESPY, but most days, she is not even the most sought-after member of her own family around the athletic department. That distinction goes instead to Braxton. Even athletic director Jack Bishop, a barrel-chested former football coach and rodeo participant, stops in mid-sentence when his softball coach and her son enter his office. A smile spreads across his face and he reaches out to take possession of the boy, holding him in the awkward way a 64-year-old man more accustomed to holding things he considers less fragile dangles an infant. Surrounded here at all times by students at the other end of childhood, people seem to like being part of a beginning. Holtman tried working from home for a time after Braxton was born, but even with barely a mile separating her house from her office in Nicholson Pavilion, the distance seemed to make the paperwork and other mundane parts of the profession exponentially more cumbersome. Braxton wasn't a fussy baby, so she began taking him with her instead, letting him sleep away hours in her office and finding plenty of willing hands to look after him when she had to step out for a meeting or practice, or when she needed 15 minutes of solitude into which she could cram an hour of work. She came to this town nine years ago to play softball. She has yet to find a reason to leave. "Once I came to school here, I never went home in the summers," Holtman said. "I was here because I wanted to be here. I love this town; I love this community. The athletic department is really a family; it's a place you like to go to work -- I don't know how many places you can bring your baby to work during the day and your boss wants to hold him, your secretary wants to take him. I'm lucky to be here, and I remind myself of that every single day. "It's a great place to raise a family." This chapter of her life is literally in its infancy, matching her coaching career. On the field, she went 34-16 in her first season in charge, the second-most wins in program history. But in everything from the endless requisition forms required to replace even the most basic items at a state school to the particular language of the profession, she is learning as she goes. "Maybe she'll say one or two swear words just to get us going, but she's not really good at doing that," Central Washington junior Elena Carter admitted of her coach's pep talks. "But she tries hard." Whether or not it has anything to do with the lyrical use of expletives, Holtman laments that she has yet to master the kind of speeches Gary used to captivate the team. It's a tricky business, matching speeches crafted over the course of decades when she is only midway through her third. Even Reggie Jackson can't entirely bridge that gap. These days, when Holtman is perched in her usual place at the end of the home team's dugout nearest the outfield, it's not Jackson she sees when she looks to her right. It's Gary. She wants to find her own voice and knows the folly in trying to be a carbon copy of the man she replaced. But his experience is not unwelcome. "What's awesome about him is he loves the game so much and he loves Mallory so much," Carter said. "You can see how he mentors her and how much he influences her. And it carries over to us, so it's nice to see some of Gary in her as well. You can just tell how much she respects him as a coach and as a colleague." Holtman's selfless act on an April afternoon four years ago gave her memories to last a lifetime. This is where she builds the life in which to store them.